The crescentchests are a genus, Melanopareia, of birds from South America. The genus has long been placed with the tapaculos in the Rhinocryptidae family. Their placement there has been questioned and in 2007 the genus was placed in its own family, Melanopareiidae by the South American Classification Committee. Subsequently the family was accepted by the International Ornithological Congress Bird List and the Clements Checklist. The family Melanopareiidae was formerly erected in 2009. 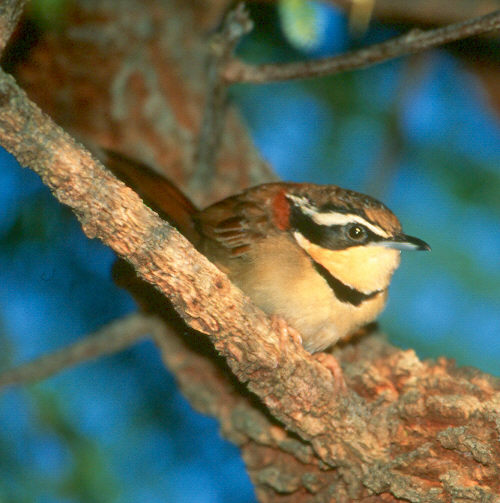 The crescentchests have relatively long tails compared to the tapaculos. The plumage is striking with a distinctive band across the chest that gives the group their name.